The Injen Power-Flow Diesel Air Intake for the Dodge Diesel is a state of the art intake system. They are dyno-tuned for peak performance and have a direct bolt in application, making installation quick and easy. 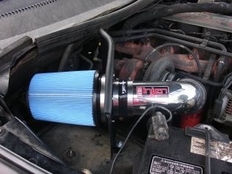 About the cleanable filter: The addition of AMSOIL Ea Air Filters to these high-quality intake systems ensures the ultimate in protection and performance. Injen recognized the unsurpassed quality of AMSOIL Ea Air Filters and sought partnership with AMSOIL in order to make the best product possible. AMSOIL Ea Diesel Intake Filters provide increased horsepower and torque, improved acceleration and fuel economy and maximum air flow. The high quality of the AMSOIL Ea Filter media offers long filter life because the filters can be cleaned and reused. Above all, Injen/AMSOIL Filters provide superior protection and maximum efficiency for engines. The part number on this item is PF8074P (or PF8074WB) and it fits 1994-2002 Dodge Ram 2500 3500 5.9 Cummins Diesel models.